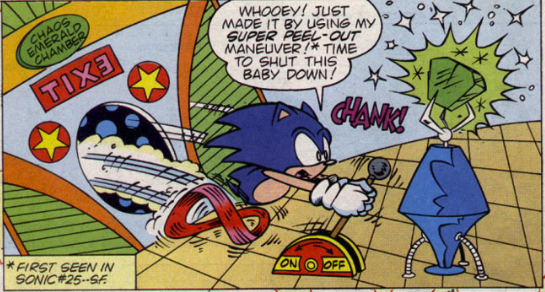 When Archie’s Sonic the Hedgehog first started, it worked on an extremely simple premise. Freedom Fighters, striking from a hidden base, have victory after victory against the evil Dr. Robotnik, although the status quo never changes. With no concern to follow continuity, the light-hearted, pun-centric stories could do whatever they wanted. 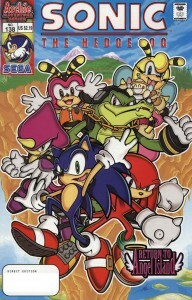 But looking at the ambitious scope of the Saturday morning cartoon‘s second season, Ken Penders was inspired to transform the comic into something that could be even greater than what was seen on the airwaves. This was when Ken’s obsession with world building began. In a fictional universe, sometimes even the smallest details can help flesh it out. One look at the original Star Wars films, for example, proves just that. When Luke and Obi-Wan walk into the Mos Eisley Cantina in the first film, all these strange creatures from across the universe are sitting together, each with their own story, adventures that go far beyond what Luke Skywalker was doing. The audience didn’t need to know the name of every species or their occupations, simply the fact they existed gave it credence. This was a living, breathing universe that had existed long before the rebels stole the plans to the Death Star. Introducing concepts and characters that could be revisited by other authors down the line was what Ken wanted to do. Build a living, breathing world where untold adventures and civilizations lay just beyond the horizon. 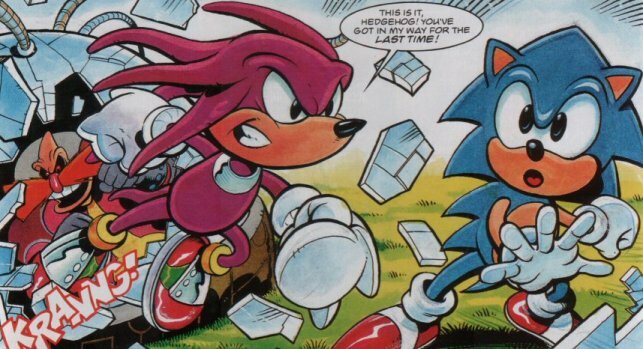 He did this before Endgame, it was the expressed purpose of Brave New World, and the Knuckles series had new idea after new idea in almost every arc. Just coming up with a slew of ideas doesn’t automatically make them good, however. Sometimes, it can even bury the story you are trying to tell. There’s no need for this, though. Especially since so much of Ken’s previous work was to help establish what kind of a world Mobius is. In the late 90’s, Ken’s main assignment was the Knuckles comic book, but that didn’t mean he never touched the main title. The Brave New World special was meant to be the launching point of the new status quo, which was followed up by Ken in a series of back-up stories in the pages of Sonic the Hedgehog. Tales of the Freedom Fighters, On Her Majesty’s Secret Service and Tales of the Great War were all multi-issue yarns to explore ideas the main stories couldn’t. The first two focused on the current situations of Princess Sally and Geoffrey St. John, while the latter was an attempt to create a timeline of events that led up to Robotnik’s taking over of the Acorn Kingdom. Teased in Issue #65, Tales of the Great War didn’t kick off until Issue #71, which also happened to be the same issue where Sonic changed into his Sonic Adventure design. 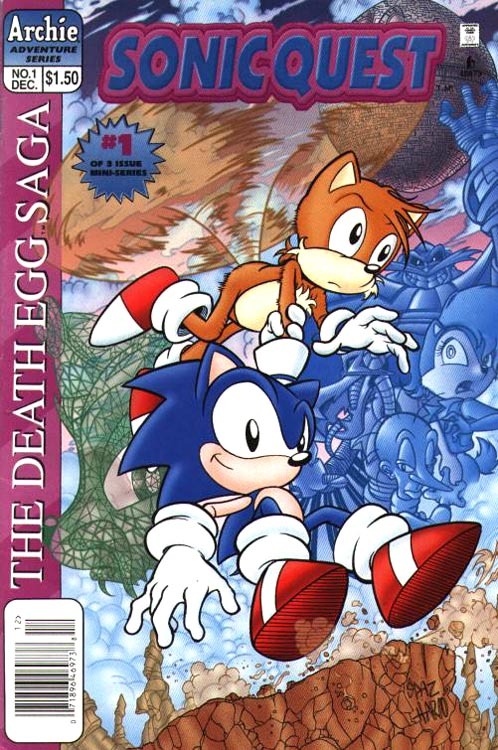 It continued until Sonic the Hedgehog #79, which was also the first main part of the Sonic Adventure adaptation. What makes that notable? 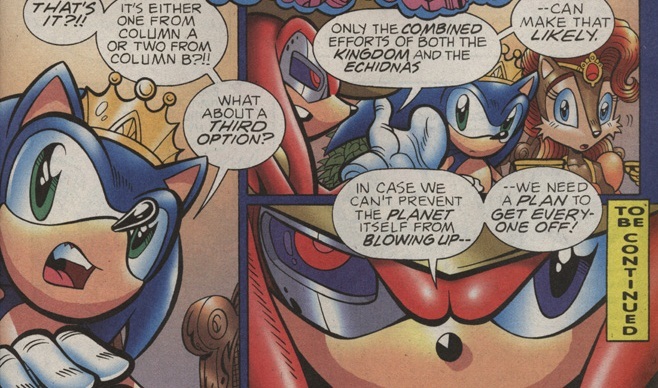 As said before, Sonic Adventure was a stark contrast from the Saturday morning world the comic was built on. Ken was telling an abridged version of The Great War, turning it into a generation-spanning epic, leaving room where someone could come in and turn it into something even bigger. At the same time, the rest of the comic was trying to figure out how to make the world of Mobius work with the video games. A writing contradiction, to be sure. There is a reason the comic started to lose people around this time, it reading like a schizophrenic patient. Ken wasn’t the source of that, and he definitely was not the only guilty party involved. But he certainly wasn’t innocent, either. The only thing I’m confused about, though, is why Ken felt the need to build the world of Mobius: 25 Years Later up just like he did with the “present day” material. The future was his playground, something very personal to him. It never felt like he was setting things up so that other people could tell stories in the future. This was his story, and he wanted to tell it until the end. A feeling he still possesses. There were so many asides and random moments that could have been dropped to tell “the final chapter” in the way it should have been, instead of the meandering mess that ended up being published. If it was written that way because he thought he would have another 20 years of short back-up stories of the future, then he was far too confident in not just the material and how it would be received, but his own status as a writer to a comic book that, at the end of the day, is meant to make kids buy video games. There isn’t as much world building in “My Dinner With Sonic” as in other installments, but there is definitely a lot of meandering about. 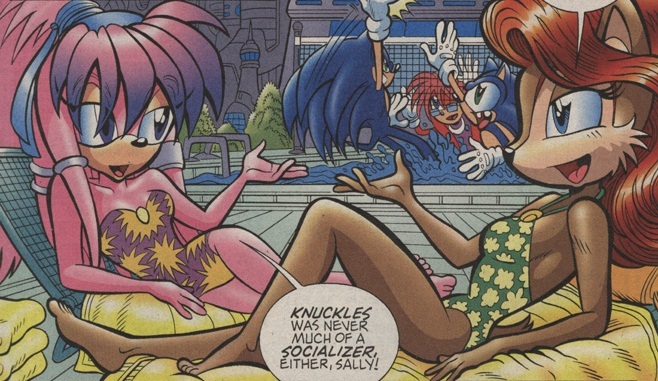 Published in Sonic #138, we start off with a text box briefly summarizing everything that has happened so far, letting us that know that the forthcoming social event has “taken on greater importance due to recent events.” Which is why we’re greeted with a scene having Julie-Su and Queen Sally lounging about at the pool. Do I even need to point out that Julie-Su is wearing something else? It’s only a one-piece bathing suit, so the artist did resist showing even more, but two women gossiping about their husbands? 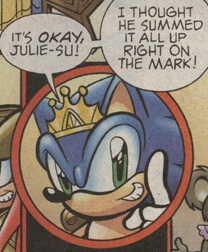 That doesn’t scream “world in crisis.” Sally talks about how hard it is for her to get Sonic to leave the house, Julie doing similar complaining. If Sonic is in the midst of his crisis, shouldn’t it be the other way around? That he doesn’t want to sit in the castle all day? I know having dinner with Knuckles isn’t a day of action and adventure, but if its really the case that Sonic wants to just stay home, then our favorite, rush-into-action hero is also suffering from depression. How awesome is that, kids? 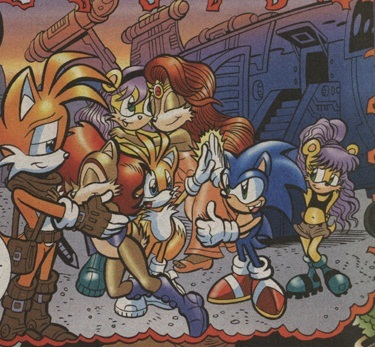 Sally even gets into Sonic and “Tails” relationship. You remember “Tails,” right? Miles “Tails” Prower, Sonic’s constant companion and best friend. The dynamic of the two has been one of the central focuses of the book. So what does Ken give us? A single panel. “Tails,” who apparently married Mina Mongoose, decided to relocate to Downunda, a thinly veiled Mobius Australia that he went to in his mini-series way back when. Why did “Tails” move? Why didn’t Sonic come to see him off? Did the pair fight because Sonic didn’t want him to leave? Or was their relationship strained for some other reason, making the decision for “Tails” to move all that easier? Ken has no answers. Not even a hint! This bombshell feels like something that should be extremely vital to Sonic’s character, and have repercussions about everything else the hedgehog is going through. But no, its glossed over so that we can spend more time looking at Sally’s legs. 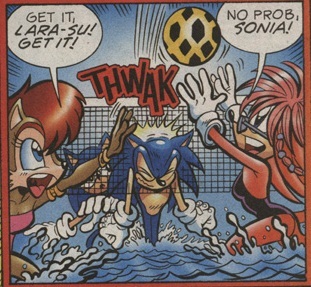 While the women are gossiping, Sonic is busy in the pool, playing volleyball with his children and Lara-Su. This is the first time we get to see his daughter Sonia, her previous appearance being half her head in a panel. Sure, she is in a bathing suit herself, but at least the artist is smart enough not to focus on it. When you’ve been busy sexualizing every other woman on the page, it might be easy to forget, especially since Sonia looks exactly like Sally. Manik, on the other hand, is still acting like an annoying teenager, trying to showboat as he pushes his dad aside in the game. Sonic won’t have none of this, pushing him into the water so he can have a crack at the ball. 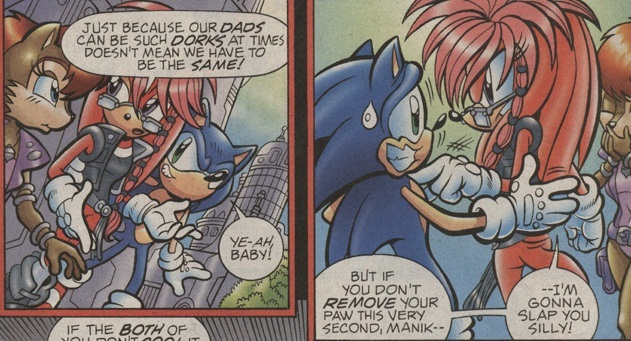 Yes, Manik is annoying, but Sonic should have a bit of restraint. Not like I’m surprised he’s acting like his 16 year old self. The point still stands, though. Knuckles interrupts the scene, pointing out how they’ve gone from overthrowing dictators to dunking kids in pools. Perfect commentary for the comic as a whole. It also seems that Sonic, Knuckles and the rest haven’t done anything else in the last 25 years except get married and have babies. I understand the Robotnik Wars were huge deals in their lives, but they sure bring it up casually. Post Traumatic Stress Disorder must not exist on Mobius. You know who else brings up their escapades 25 years before hand? Down-and-out jocks at their high school reunions. Asking why he isn’t in the pool with them, Knuckles tells Sonic that he doesn’t do water. Wait a minute. Isn’t it Sonic who doesn’t do water? His one weakness is that he can’t swim! Great attention to detail there. After some quick banter, we jump to the two couples sitting at dinner, being served by our favorite sassy Koala. Knuckles doesn’t hold back at all, telling everyone that the only reason the four of them get together is so their kids can hang out, while they barely tolerate each other. And looking at this meal, I’d say he’s right. I know Sally and Julie have been getting along, but never has anyone looked so bored drinking as Sally does. And while Julie-Su gets mad at her partner, Sonic does his best title screen pose, agreeing with his friendly rival. Before Knuckles can get to the point, Abby asks everyone if they’ll want chono with dessert. Now, I’m not going to lie. I had no idea what she was referring to, so I used Google to see what would come up. The first result was a Japanese professional wrestler, and while that would be an amusing visual, I don’t think SEGA would allow that. The only reference to food I could find was a winery. So its safe to assume that Sonic and the gang are about to get their drink on. If only Sonic Sez could see them now! 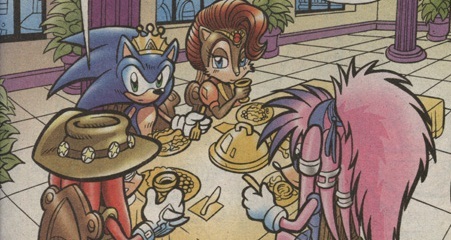 Knuckles tries to act sophisticated by telling Abby how everyone at the table wants their drink to be, with Sonic drinking it straight and Sally having a mint twist to it. Who mixes wine with anything when they drink it, though? Apparently Ken Penders. Unless they really aren’t drinking wine. Maybe chono is Mobian for whiskey. Sonic asks when Knuckles became such a gourmand, and Knuckles asks back when Sonic learned such fancy words. Ignoring the fact that people love to misuse what the word gourmand means (someone who takes great pleasure in food as opposed to gourmet, a connoisseur of food and drink), it really has nothing to do with what Knuckles said. Just because he knows what his friends like to drink doesn’t make him an expert on any of it. It just makes him the go-to person when you have to get a last minute gift and have no idea what your Secret Santa would like. This causes Sonic and Knuckles to get into a fight. Yes, really. Them having a gentle ribbing at how they’ve matured causes a shouting match to erupt. A couple more hints at events that have transpired in the last 25 years are dropped, with the pair trying to one up the other on how they handle crises. Before things can get really interesting, we see Lara, Sonia and Manik slink away, not wanting to watch their parents get into it. Sonia says she hopes they never fight that way, and that she would hate to lose Lara as a friend. While Lara-Su assures her that they don’t have to be in the same boat as their parents, Manik innocently whistles as he places his arm around Lara’s waist, the creepiest smile coming across him as he makes contact. Lara turns and threatens physical harm upon the young lad, who quickly backs down. It’s nice to know that Sonic’s son is such a horndog. Yes, I used that word because Sonic loves chili dogs, don’t hold it against me. Jumping back to the dinner party, both wives are standing and shouting, though Julie-Su is the only one with dialogue on the page. Is Sally just making noises at Sonic, knowing full well he never listens to a word she says? The guys belch in unison, both calming down at the same time. See, they aren’t all that different! They don’t get along because they’re both…yeah, you get what he’s going for here. Abby shows up, cutting the tension, much to Knuckles’ delight. What’s for dessert? I can’t tell, but they are chono-raisenberry flavored. So either its extremely tasty, or absolutely disgusting. Sally tries to woo her away to the kingdom with a well placed compliment, but the koala states the island is her home. Knuckles excuses the domestic, which angers Julie-Su a bit more than it should. She claims he was being rude, but his dialogue could have been way worse than “that’ll be all.” Especially since Knuckles looks so pleasant in the shot. Finally, the Guardian starts to fill Sonic in on what has been happening. He makes it sound like time is of the essence, but if that’s the case, why wait until now to start talking? Why not pull Sonic aside the moment he landed on the island? Why wait until everyone had fun in the sun? Heck, why even wait until dinner is over? For knowing that the fabric of space and time is threatened, Knuckles sure is calm about everything. Bringing up the crazy weather that we’ve barely seen, Sonic at first says that Knuckles is crazy. Sonic’s tune changes once he finds out that Rotor is one of those who realized what has been happening, Knuckles going on about how he’s had multiple discussions with Cobar, the Echidna scientist and Rotor’s partner in crime. Not exactly sure when he had the time to have all these meetings, since the comic made it seem this has all been happening rather quickly. Two possible outcomes are presented: either they figure out a way to stop whatever is happening from happening, or that’ll be the end. Sonic asks if there’s any alternatives, though I don’t see why he doesn’t just latch towards the first choice. He is Sonic the Hedgehog, he’s supposed to run in and make brash decisions, not try to find compromise with uncontrollable forces. Knuckles does say that there is another option if the Acorn Kingdom and Echidna civilization join forces: if they can’t stop the destruction of the planet, then they need to find a way to get everyone off. The way Knuckles words it, he makes it sound like Mobius is about to explode just like the planet Krypton, which is a bit different than the whole of creation crumbling around them. I mean, there is the Cosmic Interstate as a means to get people off, but isn’t that what got them in this mess in the first place? There you have it. Another eight-pager come and gone, setting the stage for the eighth time. Sonic, Sally and Julie-Su are caught up to speed, and the fate of the world lies in the balance. They sure are calm about the whole thing, though. With Knuckles telling everyone in his house, it brings up the point I made weeks ago: why didn’t Rotor just come over and tell Knuckles here? Sure, we wouldn’t have the dangling Lien-Da plot point, but where has that gone so far? Is she meant to be an antagonist in all this? Would she fight with Knuckles to prevent him from saving all of Mobius? That would be a silly thing to do. We won’t find the answers yet. But don’t worry, we still have six issues of Penders to get through. Something is bound to happen, right? …wait. Lara-Su was wearing her glasses in the pool. While playing a game of volleyball. Who…who does that?! Can her parents not afford contacts or something? I’ve been reading this review from Part 1 and I look forward to every part of it. Nice review. 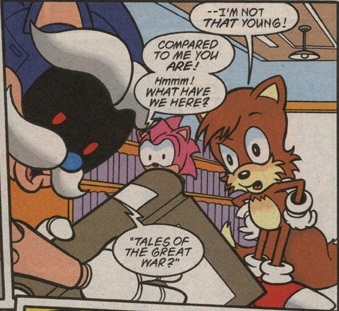 I’ve never read a Sonic comic but some parts served as a history lesson, thanks! Are these the comics from before, or are they already finished, because I’m pretty sure I saw that Beach picture someplace else. These comics are older than time itself. Or nine years.